Yukon is roughly shaped like a right angled triangle, and borders the American State of Alaska in Canada's north west. 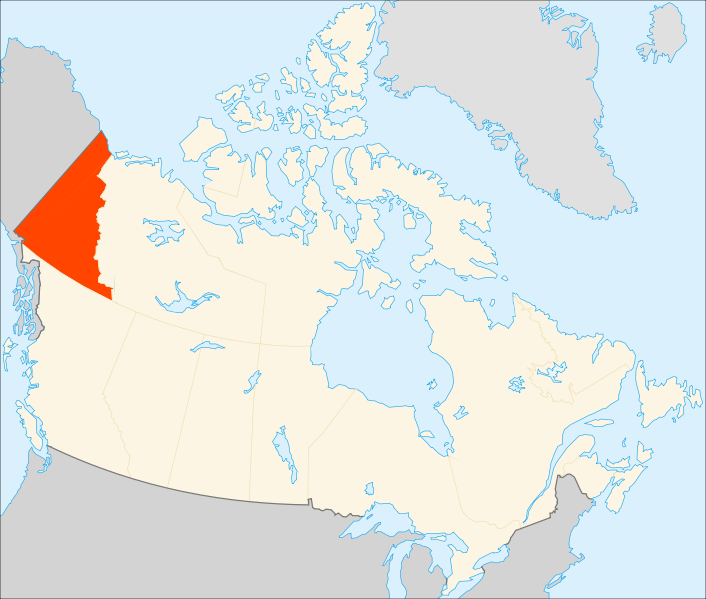 The Yukon was formed out of what was left of the territory controlled by the Hudsons Bay Company after it was divided up once the Canadian Federation took control. The Yukon is sparsely populated, and its environment is arctic or sub-arctic. This means that it has long, cold winters. Also, it has a short summer. However, there is little precipitation. European explorers first arrived in the 19th Century, slowly trickling in on the hunt of new sources of fur. These new trading routes, and the establishment of trading posts by the Hudsons Bay Comapny actually reached well into Alaska at the time. However, nothing was done to expel them, as Russia did not have the ability to push them out. However, the Hudsons Bay Company WAS forced back into Yukon proper in 1869, when the Americans purchased Alaska from Russia. Tensions did begin to rise between America and Canada with the discovery of gold in Yukon. The Americans sent a US Army Lieutenant Frederick Schwatka down the Yukon to survey for gold. This so alarmed Canada that they sent their own survey mission in response. 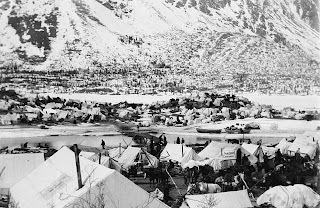 In 1896, Yukon saw a massive population explosion, and saw the Yukon formally created out of the Northwest Territories. 1896 saw the discovery of gold, and the initiation of the Klondike gold rush, which saw a massive leap in its population as people rushed to win their riches. So concerned by the influx of Americans, the Canadian government created a new territory to handle the influx, and better control the situation. The population jumped to just over 27,000. A number the territory would not see again until 1991. By the 1920's, with the end of the gold rush, the population dropped back to just over 4,000. And remained static until the 1940's. This is despite the growth of other mining opportunities, and a mini-spike in the price of gold in the 1930's. A lot of it is due to the inhospitable nature of the Yukon. Just getting there was very tough. As well as the arctic temperatures. During this time, Yukon was effectively directly controlled by the Canadian government, and the elected government consisted of just 3 people. However, the territory finally opened up in the 1940's, when as part of the war effort to move raw materials from the Yukon and Alaska, the Alaskan Highway was constructed. This, as well as further highway construction led to a mining boom through the 60's and 70's with further metals being discovered and mined out. However, today, mining is NOT the biggest sector. It is the government. In order to help with employment, the Canadian government has shifted many functions to the territory. Also, Yukon has a significant tourism sector, as well as hydroelectricity. Yukon, being so sparsely populated, and with little by why of government for a long time, did not have its own iconography. 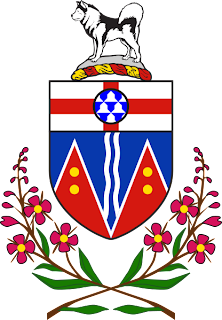 So, the Yukon finally got its first coat of arms in the 1950's and was designed by Alan Beddoe, a heraldry expert. The shield proper is divided into 2. The lower half is divided into red and blue, with 2 red triangles pointing up. They are divided by a thin white line, in order to follow the ancient heraldic law of not allowing strong colours to touch. The red represents the mountains. Each mountain features 2 gold disks, representing the area's mineral wealth. 2 wavy white lines run down the centre representing the area's rivers. Above this is a red cross on white, the Flag of England. The flag i defaced by a disk. The pattern on the disk is called "vair" or a heraldic squirrel fur. This represents the territory's history with the fur trade. The crest is an Alaskan Malamute dog standing on a mound of snow, and surrounded by a wreath of Fireweed, the floral emblem of the Yukon. 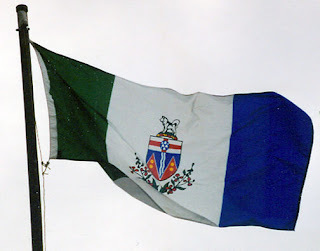 Initially, Yukon used a Royal Blue ensign as its flag, with the shield (stripped of its supporters) placed in a white shield on the fly. 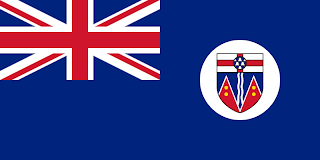 However, a new flag was commissioned in 1967 as part of Canada's 100 year anniversary, and a final choice was unveiled a year later. 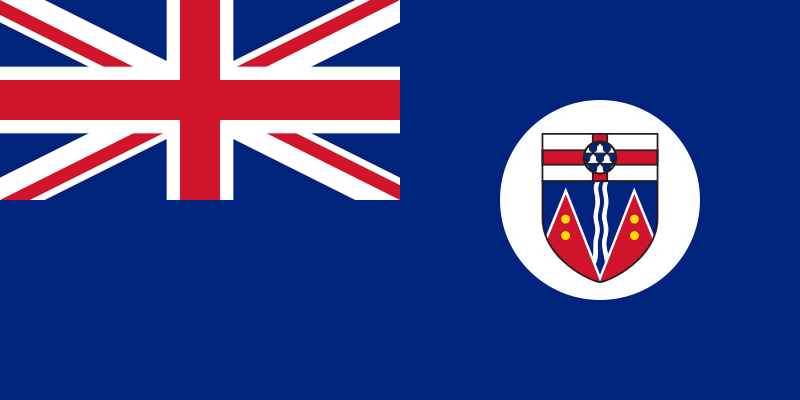 The flag itself is a tricolour, defaced with the territory's coat of arms placed in the centre. The tricolour consists of 3 stripes. Green, white, and blue. The green represents Yukon's forests, the white represents the snows, and the blue represents the lakes and rivers of Yukon.